Michaelmas have been subject for shifting dates, varying from the fast in honour of the Cross in the Orthodox Church spanning from the 14th to 27th of September and until 11th of October as was the day of the Old Michaelmas. Legend tells that on this day Satan was thrown out from heaven and landed in brambles, hence the blackberries should not be collected after this date as Satan defecated upon the berries on this day and made them poisonous. Other stories of probably East European origin informs us that the bramble and blackberry was formed by the Devil as his response to grapes, hence its praise name as The Devil’s Grapes. Henry Corbin in his brilliant presentation of Ishmaelite Sufism comments that the Balance represents the four pillars of the Temple of the Ka'bah supported by the four archangels Seraphiel, Michael, Gabriel and Azrael, each one of them being conceived as the heart of the four main prophets, Adam, Abraham, Jesus and Muhammad. The four pillars guard the throne where the Black Stone is set. This provides intense dimensions to Michaelmas in the guise of the equinox of the Sun’s entrance in the sign of the Balance, the Black Stone being the heart of Venus. Michaelmas is today related to the equinox of spring or autumn, depending on which side of the equator you find your habitat. The changing seasons in either way is born from the path of the Sun entering the sign of Libra or the Balance. Libra is ruled by Venus and is the bane of Venus the Sun now enters. The triad of stars used as a belt by Orion the hunter is called the three Mari’s is reflections of Venus as she moves from love to war through ecstasy. On this day the Great Hunter establishes the Balance between the interior Hell and the interior Eden, hence the rhythm, of perfection moves the staff of the Upright to be established so yet again the Path Direct can appear from the bewildered forest of thoughts and deeds. Yet again we can set the scales, they be of heart and feather, sulfur and mercury or truth with lie and renew the path towards self upon the Compass of Venus, in St. Michaels cloak carrying the double edged sword of true perception. 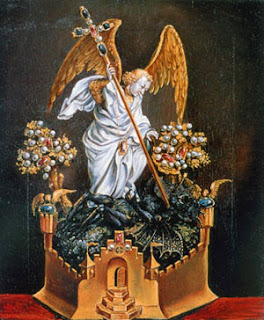 So on this day, let us bring forth the rose of resurrection, flanked by the Grapes of Eden and the Grapes of Hell and place here the dagger that cuts both ways as three lamps cast its golden light over the mystery of the Balance. Pour milk and honey over the stone of beginning so the memory of the light can again flash out upon the world of Mari under the watchful gaze of the Hunter, under the sword and cloak of St. Michael; let the worlds of promise sprout and blossom. With this let us raise the burning sickle and praise the land, the heavens and the steps taken that led us to this holy juncture! With this I raise my glass, the wine red with oath and blood and I bow in gratitude as I give thanks in the moment I cease myself in you, He and She! Amen!